I’m Umm Khalid from Atlanta, Georiga USA. I hand paint wooden Islamic dolls. They are available in all skin tones, genders and cultures. I also personalize the dolls to look like your own family! It was at the urging of my family that I decided to take a go at selling my dolls online. I was quite nervous at first and unsure of the process but I had some amazing support and help from many sisters, particularly Nazima (Nutrition by Nazima), barakallahu feeha. Where did the idea of personalised dolls come from? My daughter! 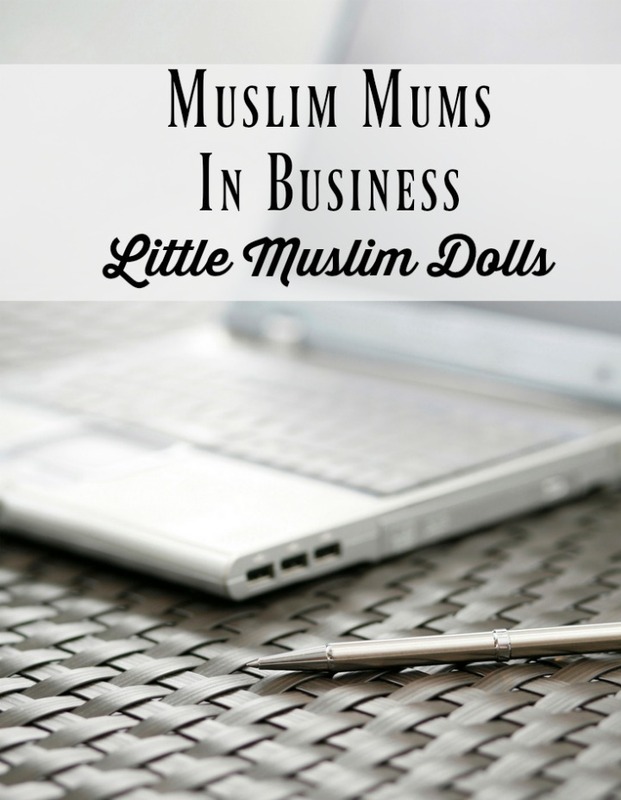 She requested a Muslim doll for Eid last year and after having spent time and money on many other Muslim looking dolls in the past, I was looking for something different. 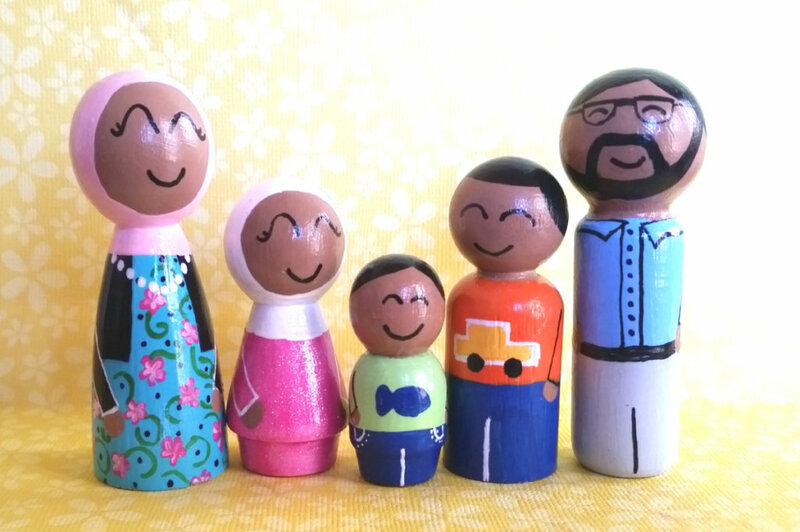 By chance, I came across peg dolls online and realized I could just make the Muslim dolls myself. And better yet, I could make the exact doll she wanted – clothing style, favorite colors, etc. Then my son asked for some “boy dolls” to look like him and before I knew it, I was making a couple dozen dolls that looked like our entire extended family! Honestly, the only way I can be at a work at home mother, by the Mercy of Allah, is with the support of my family. My husband and children have been my biggest fans since day one and I try to include them in all my business decisions. I frequently consult my kids for inspiration and ideas. After all, they are my target audience! The number one main challenge is balancing work and home life, all while trying to work from home. Over time, I have learned to create boundaries to better separate these two aspects of my life. It is absolutely crucial to stay organized and manage time, so as to be fair to both my family and the customers. I still struggle with this, as I think most work at home mothers do, but alhamdulillah its a work in progress. I don’t think any day of mine is “typical” lol . I homeschool my 4 young children so our schedules are flexible and mostly unplanned. I try my best not to paint or attend to orders during the day and reserve that time for my family, teaching and other personal obligations. The evening hours, after kids are tucked away in bed, is the best time for me to get work done. The biggest pro for me is the flexibility of schedule. There are some days where the kids just need more of my attention or I just want a slow day at home, then I can do that, alhamdulillah. There are no clock-in times or dress codes to abide by. And of course, being your own boss is very appealing. I don’t have to seek someones permission or approval to try out a new idea; if I like it, I can try it out. If a project or idea just doesn’t make me happy, I can toss it and try something else. On the flip side of that, one of the biggest cons is the lack of socialization as a work at home mom. I think mothers have a hard enough time finding ways to be social, and working from home makes it even harder. There is no opportunity to meet people “in the office” when your office may very well be your living room. Its not impossible, but it’s a lot harder. A huge motivation for me is the reviews and feedback from customers. I hear deeply personal stories about the dolls being used by school psychologists, as new baby announcements or , like it was my for my children, a doll that looks like them or their family and how much joy that brings to them. It means so much to me that they are happy with the product. It makes those all-nighters worth it! I would love to expand my products to Islamic educational toys and tools. Everything from learning Arabic to Islamic concepts, all using hand painted wooden toys. I notice you are selling on Etsy…any plans for a website? It is something I hope to have in the future inshallah. But as a new brand, I am trying to keep things simple and stick to Etsy for now. Any more products in the pipeline? Yes, alhamdulillah! So many project ideas, so little time! I don’t want to give any surprises away, but there is a really fun collaboration with another extremely talented sister that should be available for Eid ul Adha, insha’allah. Stay tuned! I would tell other moms to stay confident and positive, and be prepared for making many mistakes. There’s no better way to learn how to do things, until you first mess up a few times. Say bismillah, and do it! JazakAllah Khair to sister Umm Khalid for taking the time out of her busy schedule to answer my questions! You can find her on Instagram and on Etsy. Very inspiring. Your dolls are so cute! What an amazing work of art. I totally agree with you that being a work at home mom…the good thing is the flexibility we enjoy in terms of timing etc…but yes we do lack in social interaction with outside world. Eagerly waiting to see your upcoming projects. “I would tell other moms to stay confident and positive, and be prepared for making many mistakes. There’s no better way to learn how to do things, until you first mess up a few times. Say bismillah, and do it!” I totally agree! Oh these dolls are so cute masha’Allah. May Allah put loads of Barakah and success in her work. That’s a great initiative! I love personalised presents and I can hear you, balancing work and life is something not very easy or a piece of cake for a mother. Kim Carberry recently posted…Tiny Tickers feature on BBC Lifeline this Sunday. These dolls are adorable! And I so agree with the fact that work at home mothers end up in a dead end with no socialisation! I think these are fab for baby announcements too! Loved reading her story. The dolls are cute, and I pray for the success in her business. These dolls look very nice Well done on starting your business!